WHAT WILL YOU BE LEARNING AT THIS WORKSHOP? In this hands-on workshop, you'll be discovering the artful technique of making richly-flavored, creamy-textured raw chocolates infused with high-quality organic & nutritious superfoods. These ingredients are packed with so many vitamins, I have to put them on a separate page of my website (Superfoods Benefits Page). When Raw, Unprocessed Cacao is warmed up to liquid and mixed by hand with coconut oil, maca, coconut nectar, and other natural ingredients, an amazing & divine chocolate is created! These will taste (and melt in your mouth) unlike any chocolate you've ever had. 15 minutes after the first recipe is made, we'll be able to sample the delicious creations. 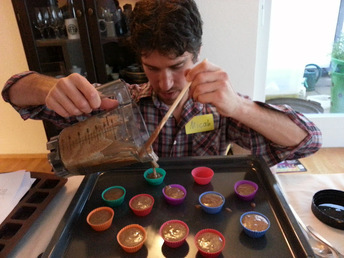 Each workshop is comprised of optional (you may sit and watch, or stand and participate) hands-on training, where you'll learn the base recipe for which all of Chocolate Therapie's flavors are created from. From there, we elaborate into at least 2-3 top flavors. My goal is to show you how easy it can be to create healthy & tasty sweets for you, your family and friends. With the upcoming holidays, you'll be like a magician-from-space introducing these new sweet'n'healthy (guilt-free and gluten-free) treats to people. I aim to source ingredients that you can find easily and show you ways to make the chocolates with simple kitchen tools. Please know that certain items are harder to find in Europe than North America. However, I found in my summer trip that Europe has some unique things we don't get access to as well, over here in the U.S.
*(This is a community center that I taught at 2 years ago, however they've moved from Aungier St. to Cuffe St.
*Aikido Studio - This Martial Arts Studio is located in the same bldg. I've provided a link to their website in the event it will help you locate the workshop space. The cost for the workshop is 33 Euros. I want to ensure people who say they want to come, and reserve a spot - do indeed show up. So I'm asking people to pay in advance to secure their spot. Please feel welcomed to contact me if you have any questions.